We can all agree: there are few things in this world more exasperating than a bad commute. Traffic jams, train delays, and crowded buses not only put us in a bad mood, but rob businesses of countless hours of productivity. Fortunately, Hitachi has launched a new platform that’s aimed at alleviating this vexation, as well as bringing a higher level of analysis to public safety, security, and even retail applications. Announced in February, Hitachi Video Analytics (HVA) from Hitachi Insight Group—the company’s IoT division—combines computer vision and analytics to extract insights from IP-enabled cameras, with the goal of allowing cities, transportation agencies, and businesses to run more smoothly and safely than ever before. Hitachi’s scenario-based code can differentiate between different types of vehicles, providing cities with insight into street usage and traffic patterns. HVA analyzes video feeds to provide a wide variety of insights. For example, traffic cameras can count vehicles, analyze traffic patterns based on vehicle type, and recognize license plates. Other cameras can provide people counting, queue detection, and activity analysis. Combining information, a bus rider can know, for example, that the bus that’s arriving next will be full, and that an empty bus is on its way a few minutes behind. Urban planners can see how roads are being utilized, so they can restructure lanes and intersection to improve traffic flow. For security, HVA’s object detection technology creates a three-dimensional reconstruction of images that uses perspective, velocity, path deviation, and other measurements to recognize suspicious packages, intrusion into restricted areas, and can even provide facial recognition information to public safety departments. HVA can also provide insights to businesses in retail and advertising. For example, it can provide companies with data on how many people browse certain shelves in a store, or how many people pass by or linger near an advertisement. 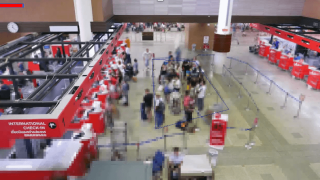 Analysis such as people counting and queue detection allow for facilities such as airports to move people through their premises as smoothly as possible. Essentially, the platform takes a device that is already found all over cities, facilities, and businesses, and enables it to serve as a generator of vast amounts of information. “With traditional IoT sensors, typically you’re getting one type of data from one sensor,” Bean said. “But with a video camera, you’re now able to get many, many different insights and alerts from the same sensor. So it’s a great evolution of this technology.” According to the company, any IP camera that is ONVIF compliant (an open standard protocol for camera communication) can feed into the HVA platform. Of course, such calculated visual observation naturally raises concerns about privacy. According to Hitachi, HVA’s Privacy Protector feature automatically detects and protects entire human figures, as opposed to other technologies that only blur people’s faces. In addition, it tracks and records all access to video data to help support transparency and help combat misuse. This feature can also be crucial for organizations like hospitals and schools, where the privacy of patients and minors is vital and protecting personally identifiable information in video data can help to reduce risk and liability. HVA is one of three components of Hitachi’s Smart City and Public Safety portfolio, along with its Video Management Platform (VMP)—a virtualized storage and networking platform on which video can be stored separately from other data, for increased security—and Hitachi Visualization Suite, which serves as a dashboard for monitoring all of the video and analysis, as well as merging information from other disparate sensors and systems to provide a map-based, unified view of all activity. According to Bean, Hitachi is currently working on training and certifying select partners and systems integrators who will support the platform.